If you've already set your sites on Crested Butte, you're already on the right track! This town is one of our favorites in the world! Not just for skiing, but also for hiking in the summer, mountain biking and even just relaxing and taking a break from the busy lives that we lead. Our house reflects this. When we first moved in, it was obviously a miner's cabin which had been brought down from Irwing lake and added on to to make a house, but it did need a little T.L.C.! In renovating it though we have kept the charm that initially drew us to it whilst adding things like a hot tub under the stars, a sauna, great insulation and cozy furnishings. Location-wise, it would be hard to beat - it's a few blocks from the main drag (Elk Avenue) and the stop for the free shuttle to the mountain is almost directly opposite the house. The house is cozy enough for a romantic getaway for 2, but also large enough for a vacation for 4 if you don't mind 2 of you crashing on the sofa bed in the living room! We've skied since we were kids. After working a ski season in Chamonix and developing a passion for backcountry skiing and hiking, we started looking for somewhere in the US where we could set up a more permanent home. When we first came to the town of Crested Butte in 2000, we realised that this was the place - with its challenging ski area, great backcountry and amazing community. Over the years we've come to appreciate all the seasons here in Crested Butte and we've grown to love this town which has managed to keep its charm and avoid the overdevelopment that you find in so many other resorts. 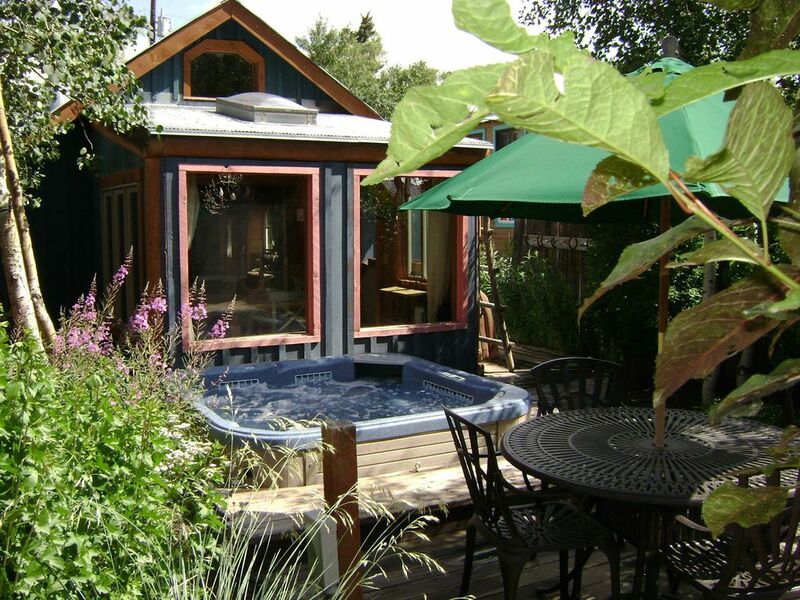 When we started looking for a house, we wanted something small and cozy in the heart of historic Crested Butte (as opposed to the mountain resort which we found less charming, especially outside of the ski season). We finally found 219 Whiterock which at the time was a bit of a wreck with a full drum kit set up in the living room and some interesting murals painted in the loft area! With a little vision, we saw the potential of this cabin and spent the next year renovating it, even adding a sauna and a hot tub in the garden Now we have this beautiful home in Crested Butte. Our home is perfectly situated in the heart of historic Crested Butte - you can walk to the shops, the restaurants, the movie house etc and the free bus for the 10 minute ride up to the mountain resort stops almost directly outside by the Nordic centre. In the summer you can hike directly from the house (Green Lake is a favorite! )and you really don't need a car unless you're planning some longer trips. Lying in the hot tub staring up at the stars and the mountains after a long day of skiing, hiking, biking or even white water rafting is just the coolest!! Enjoy! We fell in love with Crested Butte the first time we came to do some back country skiing in 2000. Since then the town hasn't stopped growing on us. Every year we discover new restaurants, new slopes, new hikes and, best of all, new friends in what has to be one of the most welcoming communities we know. Whether you come here to ski, to hike, to bike or just to relax, there is always something going on here. The day is yours for the taking! Any time of year the mountains are beautiful and challenging. Just a 10 minute ride on the free shuttle bus that stops almost outside the door, the main mountain resort never stops improving. Activities on the mountain are boundless and open to all skill levels. In the summer there are endless possibilities for camping, hiking and exploring this great area. Please note that there is a $700 minimum on any reservations.